Inside: When a pile of tomatoes are ready to be worked with, it is so important to know how to peel tomatoes quickly and effieciently. 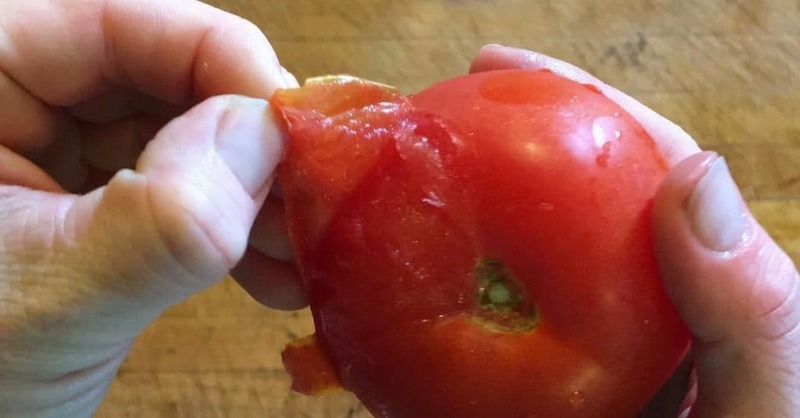 Here are 6 different ways to get that peel off those tomatoes! Confession: One year I didn’t peel my tomatoes…it seemed like an impossible job with so many tomatoes piled on the counter. I was running out of time and I didn’t want them to spoil. So I canned them. They made yummy tomato soup sauce. And when it was time to make the soup? Well, the end result was small rolled up tomato skins throughout the entire soup. Still edible (and very yummy!) but not the desired outcome. Now I know how to quickly handle those pesky peels with no problems! And it is so easy! Without further ado, let’s peel some tomatoes! 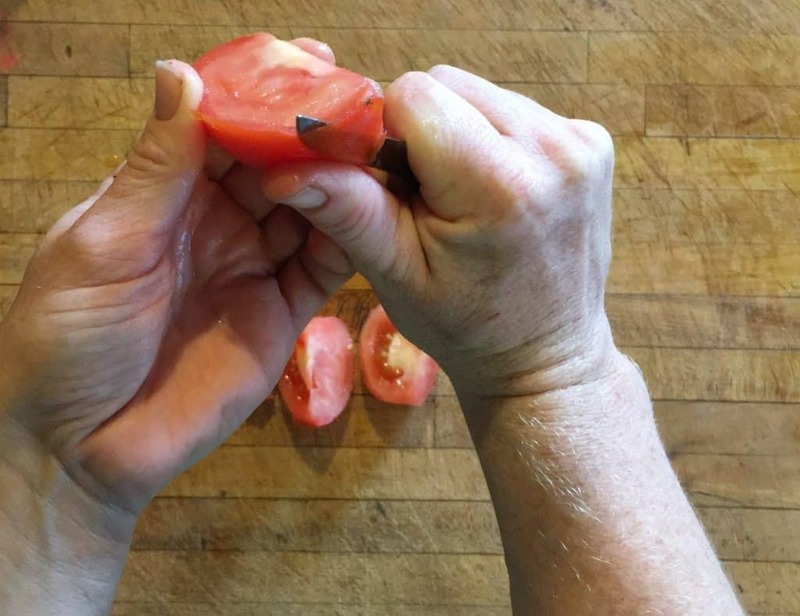 There are several ways to peel tomatoes. 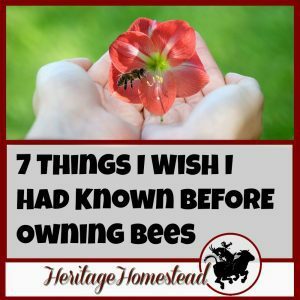 They all are very good options worth considering! Let’s explore those options. Each way will be broken down into a step by step process of how to peel tomatoes! 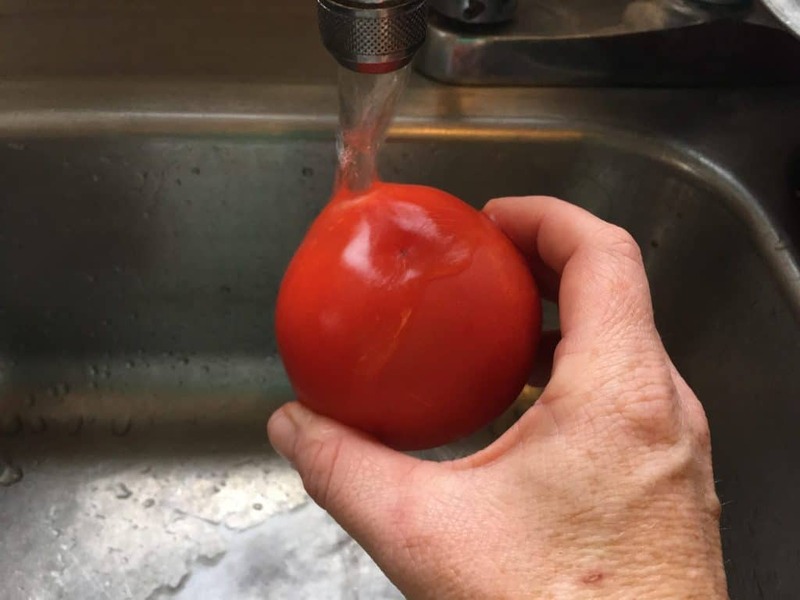 1• Peel tomatoes using boiling and freezing water. 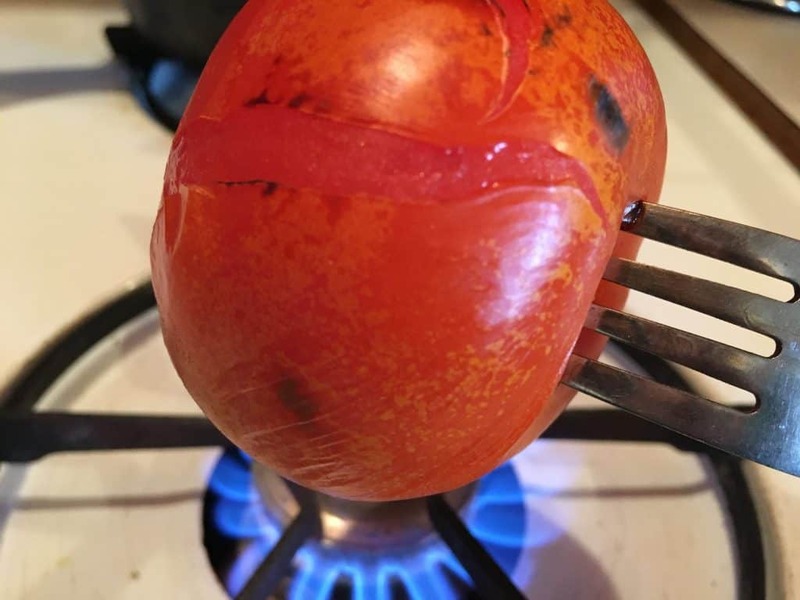 This is a great way to peel bulk tomatoes because quite a few can be boiling and cooling at the same time. The peels come off very easily. The main thing to watch for is not to cook them too long because you don’t want to be peeling cooked, soft tomatoes. Hull the tomatoes. In the clips below I didn’t hull them until after taking off the peels. It works either way! Boil water. And place the tomatoes in the water for 45-60 seconds. Place the tomatoes in FREEZING cold water. Adding ice cubes to the water may help too. We don’t keep ice trays in our freezer so it works just fine without them. Peel the tomatoes. The skins should slip right off. Pile them up and amaze everyone with your speed and awesomeness. Now the peeled tomatoes can be used for canning, making soups, sauces and anything you can think of! When life gets hectic this is a great option because it allows you to come back to them later when life is less busy. Wait…when is life less busy…? 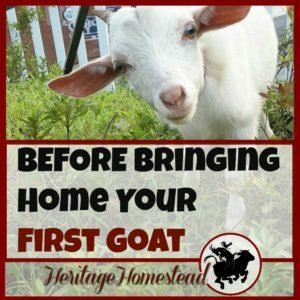 Anyways, it means you can finish canning or freezing the other garden produce before it spoils and then come back to the tomatoes later. When the time has come to work with the tomatoes, take them out of the freezer and run them under hot water. The skin will loosen up. 3• Hold over an open flame. What a great way to peel tomatoes! It is fast, easy and doesn’t cook the tomatoes at all! (Unless they are held over the flame too long.) Be ready for the tomato to “pop”. It scared me the first time. But the peel splits in several places and then is very easy to peel off. 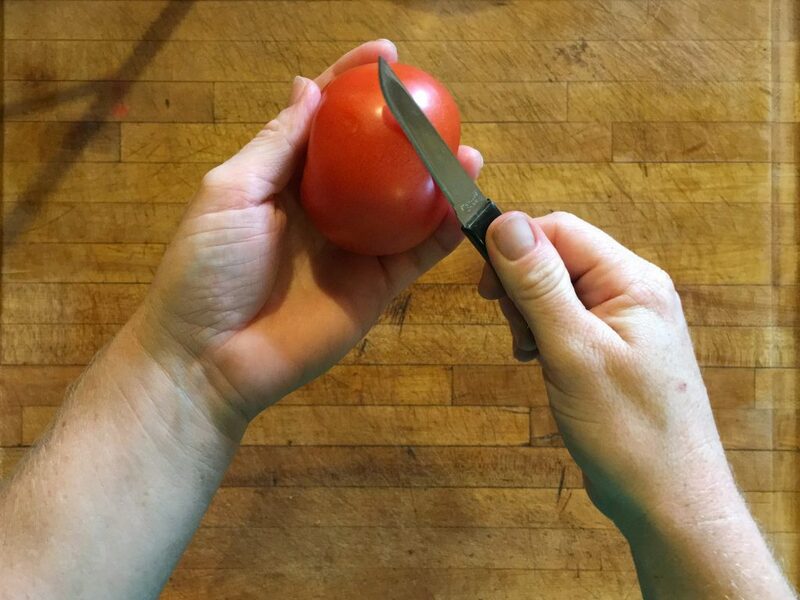 Stab the tomato with a fork. Turn on the gas stove burner to a medium flame. 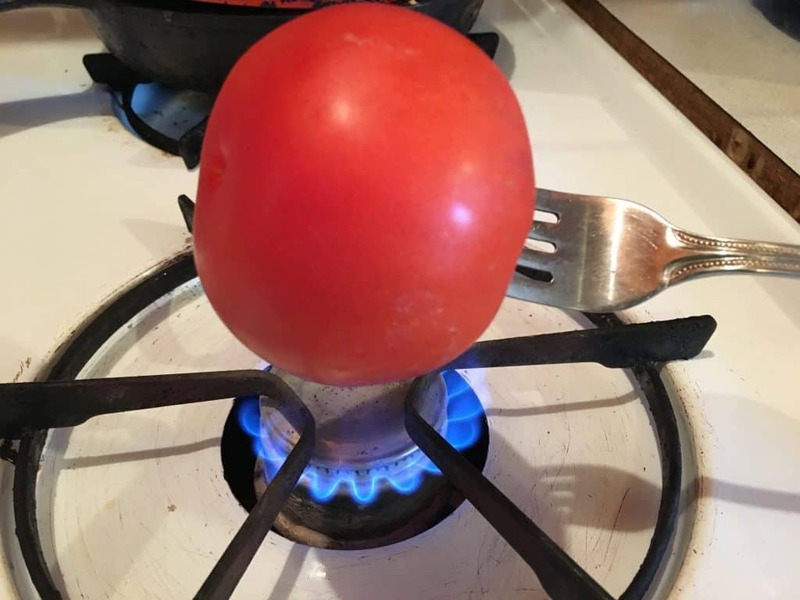 Put the tomato over the flame and turn it as it starts to “pop” (don’t jump!). The skin will start to crack. Don’t forget to get the top and bottom areas of the tomato. And also don’t cook the tomato too long. When the skin looks loose, has a yellower look to it and has split, it is ready. 4• Rub knife over tomato. No extra bowls or water needed. This probably took the longest time out of all the options but it worked! The peel came off very paper thin but also wasn’t as loose to pull off as the other options. Rub the knife over the peel very firmly without squishing the tomato. Be sure to get all the sides and top and bottom. Test to see if the peel pulls off easily. If the peel doesn’t come off easily, rub some more! 5• Cut off peel with knife. The master chef can show off! A great way to get it done if you don’t mind the occasional wasting of some of the tomato when it’s cut too deep. It’s fast, efficient and requires precise cutting skills. Depending on the size of the tomato, cut into fourths or fifths. Very carefully cut off the peel staying as close to the skin as possible. The less waste the better! This is a great way to peel and cut the tomatoes all at once! The end result is a cut up, somewhat liquified tomato, but for some recipes, that’s exactly what you want! 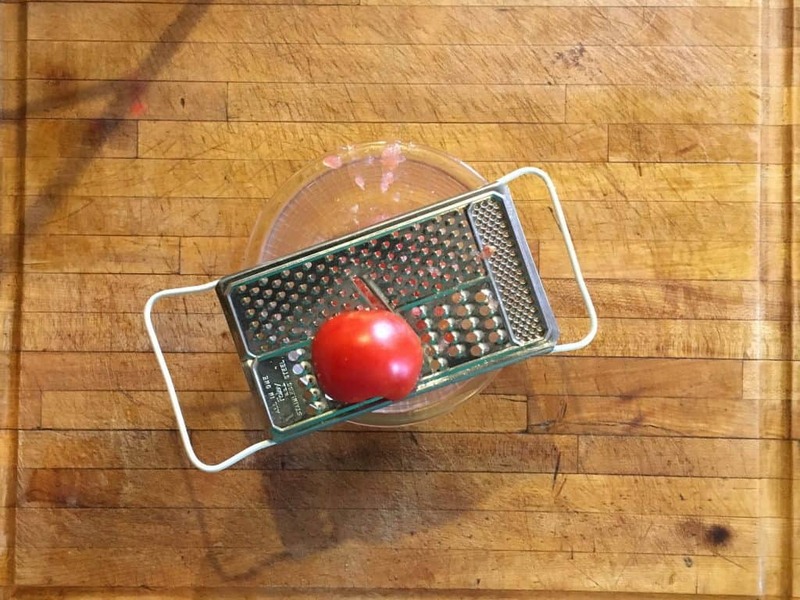 Gently push tomato half into the grater. 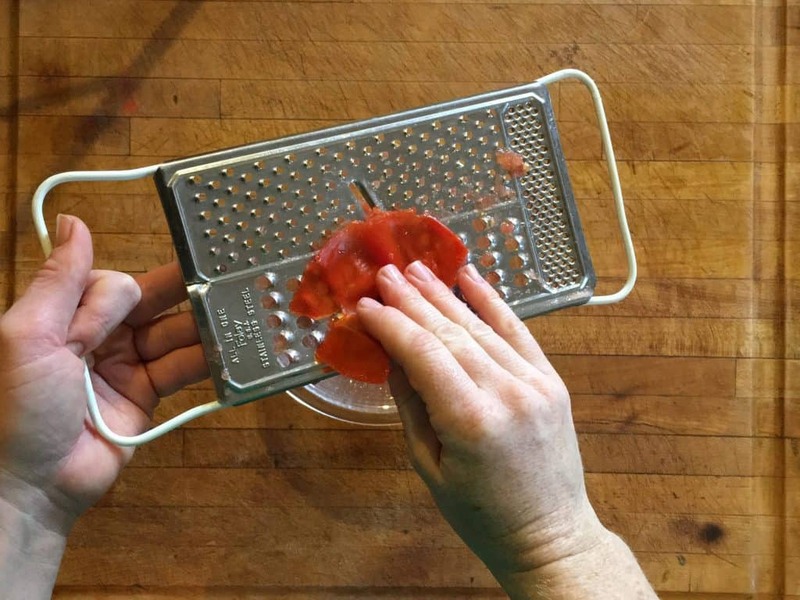 Towards the end, being very careful not to cut any fingers, push the skin into the grater and grate off the remaining tomato. Peeling tomatoes is easy! And when they are peeled you are one step closer to having canned stewed tomatoes, soups, and sauces all winter long! How do you peel yours? 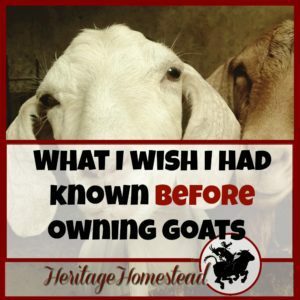 Are there any other ways to add to the list?